supply proportioning system: generally usePLD2400 type concrete batching machine, aggregate weighing system, aggregate conveying system, hoisting system of the aggregate, and aggregate excessive storage system. cement supply system: two sets of 100 tons of cement silo, screw conveyor, cement weighing hopper, and cement weighing device. Admixture supply system: screw conveyor, admixtures weighing hopper, and admixtures weighing device. Water supply system, weighing box, water supply pump, pressurized water pump, water weighing device, water jet. Additive supply system: weighing box, supply pump, pressure pump, additive weighing device. Mixing system: motor, reducer, JS1000 dual-axial mixing machine. Control system: air conditioningroom, industrial computer, control cabinet, display instrument, switchboard, and work station. 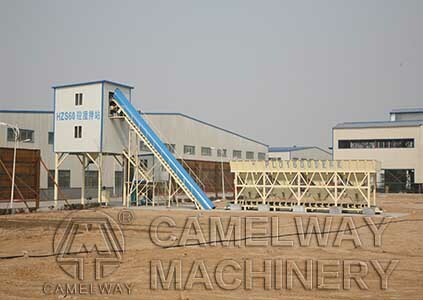 Zhengzhou CamelWay Machinery manufacture is one of the large-scale enterprise specializing in construction machinery. If you want to know more information about the concrete mixing plant or buy it, you can contact us.